Witsieshoek Mountain Lodge is located in the northern region of the majestic Drakensberg mountains. In Zulu the mountain range is called uKhahlamba, or the barrier of spears, a fitting name for the jagged peaks that make up much of the escarpment, including the imposing amphitheatre that encircles Witsieshoek Mountain Lodge. The range spans more than 1,000km across parts of the Eastern Cape, KwaZulu-Natal, Lesotho, Swaziland, Mpumalanga and Tzaneen in Limpopo Province. The Drakensberg is the highest mountain range in South Africa, rising to 3,482 metres at its highest peak, which is Thabana Ntlenyana in Lesotho. While the Drakensberg remains one of South Africa’s most unadulterated regions, tourism is developing in and around the mountains. More lodges and accommodation are increasingly becoming available, though Witsieshoek is the only lodge within the vicinity of the town of Phuthaditjhaba and the famous Sentinel Peak. The Drakensberg Mountains boasts some of the best hiking trails in all of South Africa, including Sentinel Peak and Mont-aux-Sources, both of which are accessible from Witsieshoek. Camping in the wild is a great option in this particular area as it is in much of the Drakensberg. The entire Drakensberg region also provides a plethora of other outdoor activities to engage in, and a number of national parks, game reserves and designated ‘wilderness areas’ to visit. These include uKhahlamba-Drakensberg Park and Royal Natal National Park. uKhahlamba-Drakensberg Park, which covers more than 243,000 hectares and is just a 2 hour drive from Durban and a similar distance from Witsieshoek, was named as a UNESCO World Heritage Site in 2000. The Drakensberg Mountains is home to a variety of ecosystems with rich and diverse flora and fauna. There are numerous endangered plants and an array of antelope species, as well as the rare Southern White Rhino and the roaming Chacma baboon. 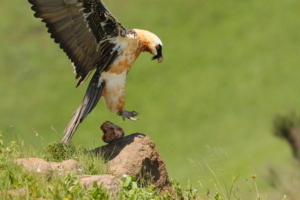 In terms of birdlife, the Drakensberg supports more than 37% of all South Africa’s non-marine avian species (around 300 species in total). 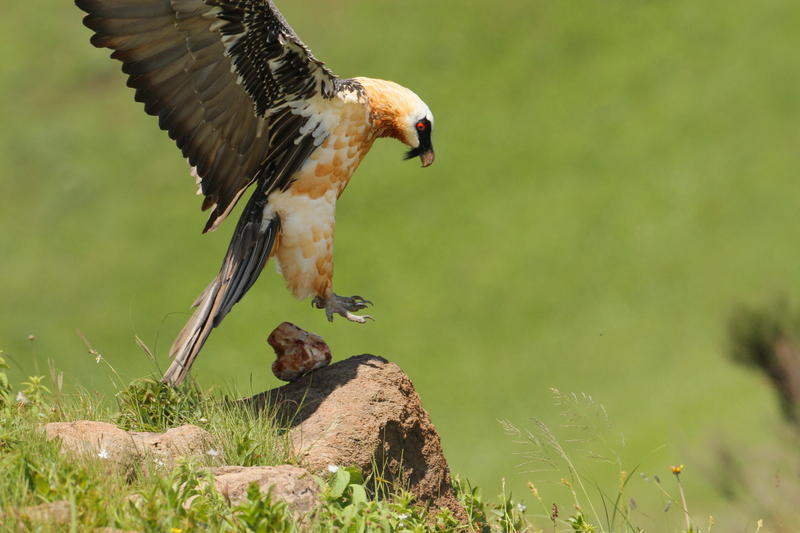 Perhaps most notably is the critically-endangered bearded vulture, which can regularly be sighted soaring across the valleys below from the panoramic restaurant at Witsieshoek. The Drakensberg is also an area of significant anthropological interest and is well known for the many ancient San rock paintings that can be found in some 500 caves throughout the region. Some of these paintings are possibly as much as 3,000 years old. Add to all this the warmth and hospitality of the local people (comprised mainly of the Batlokoa chiefdom in the areas around Witsieshoek), the striking sandstone cliffs, the unspoilt forests, the soaring peaks, the crystal clear rivers and some of the most spectacular views imaginable and it is not hard to see what makes this magical region so worth experiencing. And there are few better places to experience all that the Drakensberg Mountains has to offer than at Witsieshoek Mountain Lodge.